Financed under the Horizon 2020 framework the Accelerator Programme DeepTech4Good is committed to help DeepTech startups accelerate their development and scale up at European level. 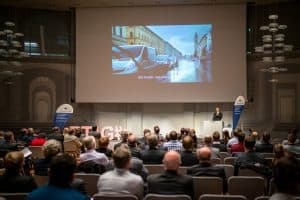 On 7th November 2018 23 startups had the chance to present their ideas during 2 pitching sessions in Haus der Wirtschaft, Stuttgart. The pitches concentrated on the 4 sectors “Industry 4.0”, “Smart Health & Well-being”, “Smart Cities” and “Smart Mobility”. The 23 candidates had been preselected out of 80 applications from all over Europe and had to convince the investors during their 5 minutes pitch. In the evening the 8 winners were awarded by Samantha Michaux, project manager at Steinbeis 2i GmbH and ambassador of the EU-initiative Startup Europe. 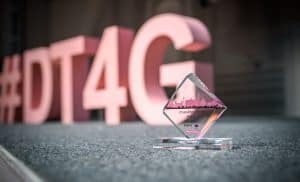 Among the winners were 6 German (Adlatus Robotics, AScon Systems, HD Vision Systems, INERATEC, Skinmade and vialytics), 1 French (Mobility Work) and 1 Austrian (EET) startup. The winners can look forward to a personal coaching. Access to a European Network and the collaboration with experts will support the startups in their future scale-up process and will accompany their future innovation projects in order to become the future “DeepTech Unicorns” in Europe. 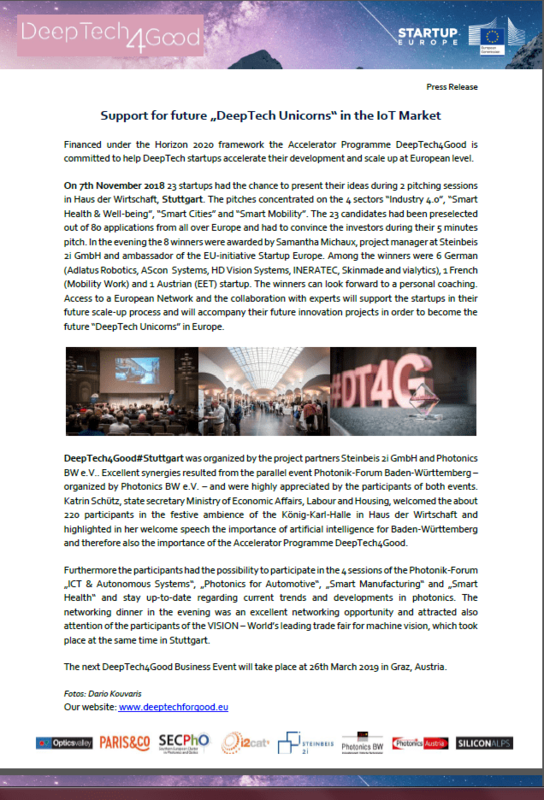 DeepTech4Good#Stuttgart was organized by the project partners Steinbeis 2i GmbH and Photonics BW e.V.. Excellent synergies resulted from the parallel event Photonik-Forum Baden-Württemberg – organized by Photonics BW e.V. – and were highly appreciated by the participants of both events. Katrin Schütz, state secretary Ministry of Economic Affairs, Labour and Housing, welcomed the about 220 participants in the festive ambience of the König-Karl-Halle in Haus der Wirtschaft and highlighted in her welcome speech the importance of artificial intelligence for Baden-Württemberg and therefore also the importance of the Accelerator Programme DeepTech4Good. Furthermore the participants had the possibility to participate in the 4 sessions of the Photonik-Forum „ICT & Autonomous Systems“, „Photonics for Automotive“, „Smart Manufacturing“ and „Smart Health“ and stay up-to-date regarding current trends and developments in photonics. 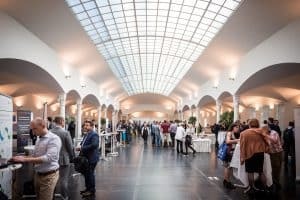 The networking dinner in the evening was an excellent networking opportunity and attracted also attention of the participants of the VISION – World’s leading trade fair for machine vision, which took place at the same time in Stuttgart.